This is a recent evolution of an earlier ring of mine . 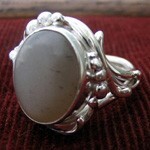 Can be ordered for the same price with a variety of common stones. 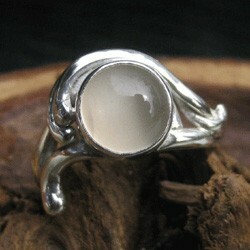 This is an all time favorite handcrafted ring design by Hawk and Owl. 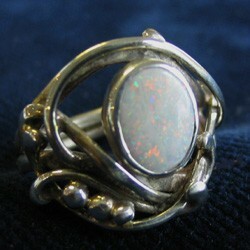 Substitute stones for this ring are Moonstone, lapis lazuli, malachite, turquoise, amber, carnelian and garnet. A very nice Australian opal set in a Unique one of a kind design by Hawk and Owl. 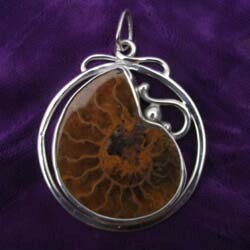 Here is an ammonite fossil pendant in silver. Ammonites lived till about 65 million years ago. Both BC and Alberta have many types of ammonites from the lower cretaceous age. 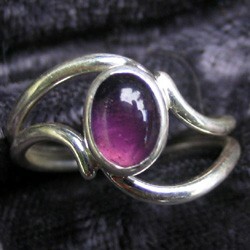 This one of a kind custom ring in a unique art nouveau design is a hand made original ring. email for a free consultation.